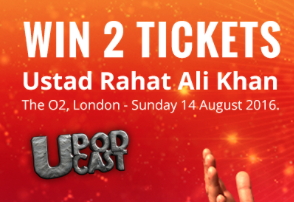 Pakistan’s most famous Qawwali singer Ustad Rahat Fateh Khan, the nephew of the late, world-renowned singer Ustad Nusrat Fateh Ali Khan, will perform his greatest hits live for the first time at The O2 on Sunday 14 August 2016. Tickets go on sale at 9am on Friday 22 April and are available at AXS.com or by calling 0844 856 0202 or from www.theo2.co.uk.www.theo2.co.uk. But we have a pair of tickets to give away for Free! and it couldn’t be easier. Just click on the banner below and sign up with your email adress, and the lucky winner will be randomly drawn. Deadline for the the competition is 8th of August! So sign up ASAP! The performance will coincide with Pakistan and India’s independence weekend celebrations and will be Ustad Rahat Fateh Khan’s only London show this year. Discussing his forthcoming show Ustad Rahat Fateh Khan said; ”I’m very excited to be performing at The O2, London, for the second time, following my sold out tour in 2013. Ustad Rahat Fateh Ali Khan was chosen at birth by his uncle Ustad Nusrat Fateh Ali Khan for tutoring in the traditions of qawwali music, a form of Sufi devotional popular in South Asia. Six weeks after his uncle’s death in 1997, Rahat Fateh Ali Khan took his position as leader of the group and has since become one of the most talked about Pakistani artists in the world. Ustad Rahat Fateh Ali Khan has performed on a variety of recordings, and his songs and vocals have featured in numerous hit Hollywood and Bollywood films including Bodyguard, My Name is Khan, Dabangg, Bajrangi Bhaijaan, Drishyam, the Hollywood film Apocalypto and many more. The maestro has released over 50 albums with over 100 hits in Bollywood and has been presented with numerous awards including Star Screen Awards for Best Male Playback 2010 and the IIFA award for best male vocalist 2011. He has also been a judge on top TV shows in India such a Chhote Ustad and Junoon, Kuch Kar Dikhaane Ka. He was the headline performer at the Nobel Peace Prize Concert in 2014 and recently performed at the United Nations General Assembly Hall in March 2016. In 2014, Ustad Rahat Fateh Ali Khan released his latest album ‘Back 2 Love’ which sold millions of copies worldwide. The ticket will also include access to a variety of free live events and activities including Bollywood dance workshops, DJs, specially selected street food stalls and more.